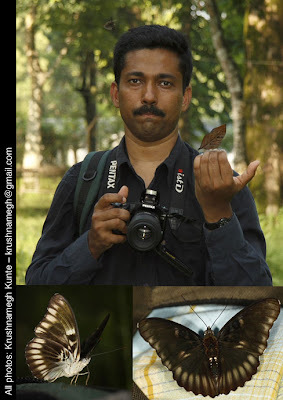 Here are the Best Photo of 2007 by members of ButterflyIndia. Click on the image for full size. 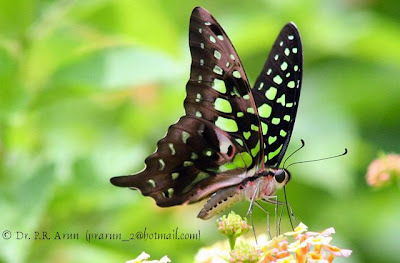 shot at the butterfly india meet at AP the best. 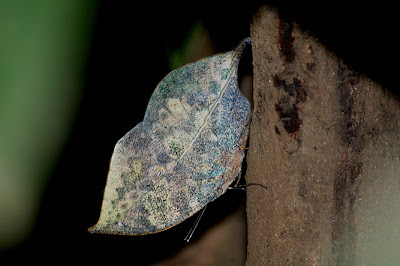 Leaf Blue Amblypodia anita at Phansad WLS, Raigad on 27 Jan 2007 I was actually waiting for Map to arrive but there was feast around. 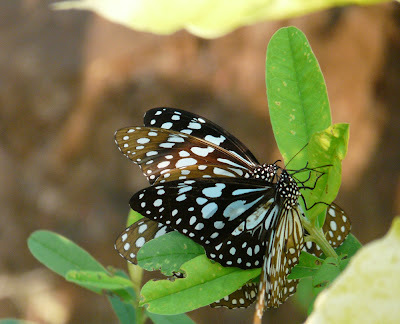 There were many butterflies, birds around. 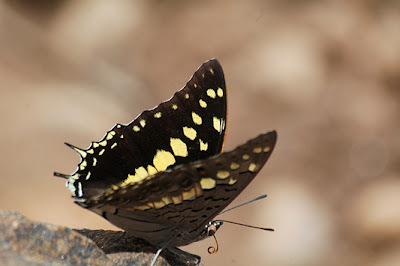 *Common Baron - *At Matheran - 9th Nov 2007.
the first one (Black Raja) we got in the day after the last day, when almost everybody were gone. me nelson rudra are the few lucky one to got this image beside a straem. 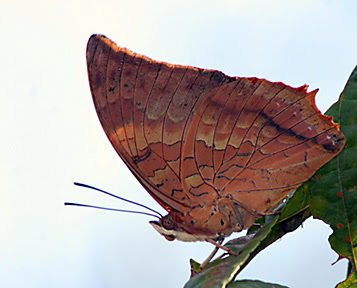 the second one (Orange Oakleaf) was the same specimen that of vidya, her was open wing and mine the closed wing. we all were excited after getting this. on that day we were very lucky to get one stream glory also which Vidya mentioned in her story as Vijay's pick. 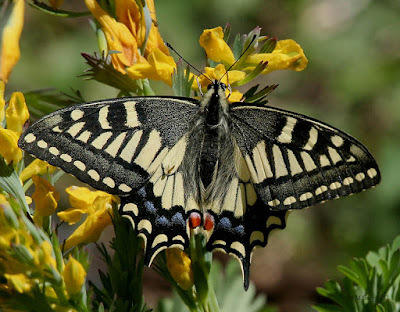 Common Yellow Swallowtail (Papilio machaon) Though, it's difficult to point out which is the best in 2007, I am choosing this one. First, it has so much of details & is so beautiful. 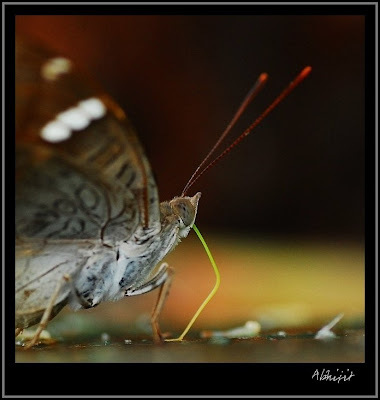 Second, it was really difficult to get a patient shot with this butterfly as it's very fast & constantly moving. 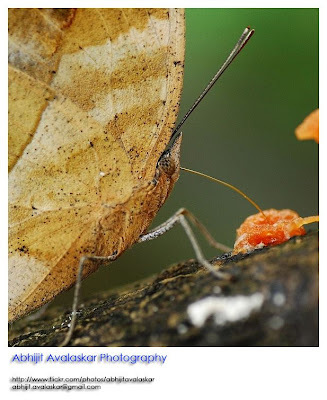 Finally, because I saw a children's pictorial book at Oxford, devoted on this particular butterfly, illustrating all stages of a butterfly from egg-laying to its emergence, in brief. I was so thrilled to capture this beauty in all its details. Shot was taken in May'07 in Himachal during Sar Pass Trek. 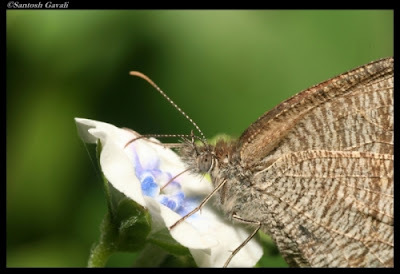 My best pic of 2007 is of the very common Blue Tiger (Tirumala limniace). It was in the month of November, at the Swan Country Club near Yewoor, Thane. 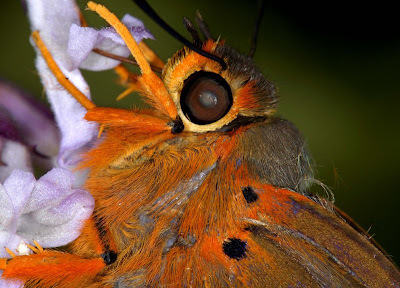 There were hundreds of milkweed butterflies, all scrambling in a frenzied manner to get as much of the coveted alkaloids as possible, from the Crotolaria plants. It was really fascinating to watch them, all of them with their proboscis unfurled, gorging away. 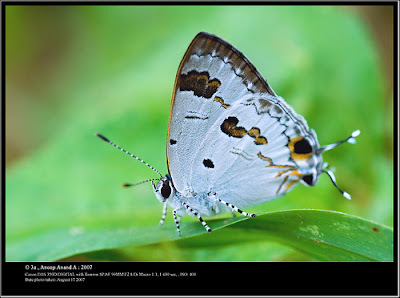 confused about which one to be added but this image is of importance because on a recent visit (Flickr Meet @ Vagamon) we witnessed an area , mostly marshy n full of tall trees n shrubs, full of this species, resting on tree tops. Don't know whether this is part of a migratory group. 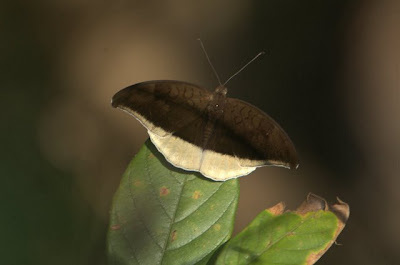 Vagamon is a high altitude area in Idukki district of Kerala (similiar to Munnar) n there were more than 5000 of them. 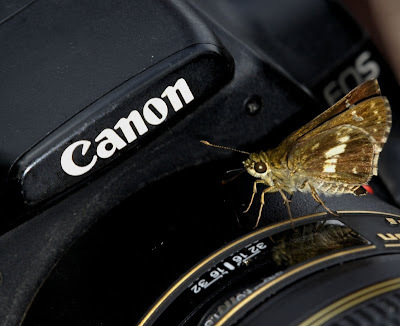 Many of us fotographed the scene and many have better captures than self. can somebody educate me about this ??? a sort of migration or is it somethingelse??? 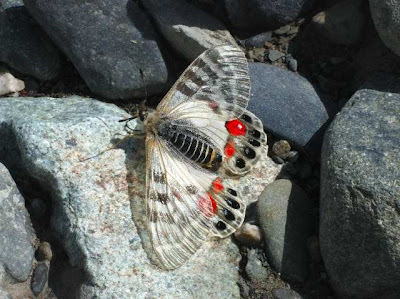 REGAL APOLLO (Parnassius charltonius) Photographed in Ladakh at 12000 ft in Hemis National Park, Ladakh (J&K). after a trip to the NE this year it is impossible to pick one image (or 10 or even 100!) as my favourite. but i am sending one that has a story associated with it. 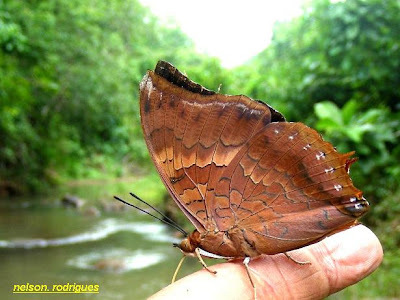 check out rafeek, and an Orange Oakleaf (Kallima inachus) sitting on his hand. nice, eh? now check what's hovering over his head! 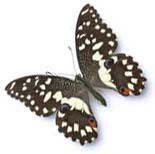 i noticed this black & white butterfly in this picture just a few days ago. 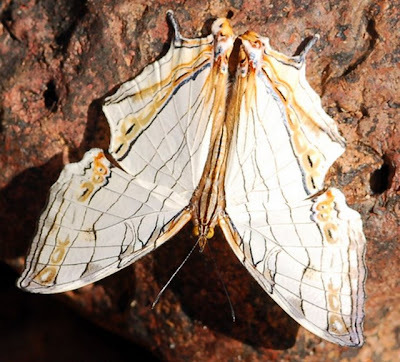 i was excited about this because this butterfly (pictures at the bottom), as it turns out, has a very strange pattern, nothing like anything in any books i have. 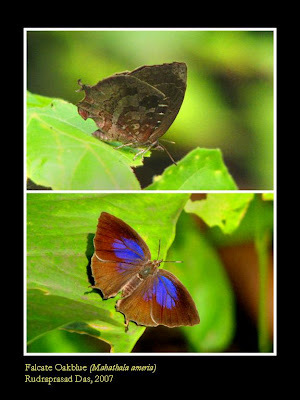 my best guess is that if it is not an aberrant Blackvein Sergeant (Athyma ranga), then it is a new species. 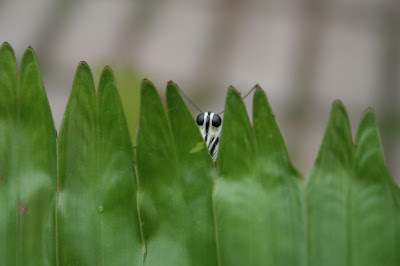 in any case, i think i took rafeek's picture before we were even aware of this butterfly. imagine if rafeek's picture had been the only evidence of its existence there! a fascinating thought!! 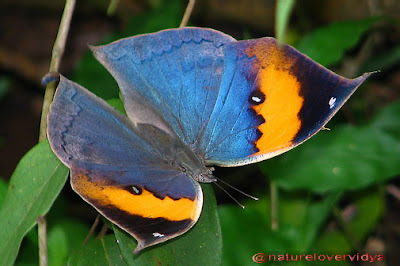 The photographs of Falcate Oakblue (Mahathala ameria) are my best from the lot. Although they are not very crispy one, but they gave me great pleasure when I photographed it. 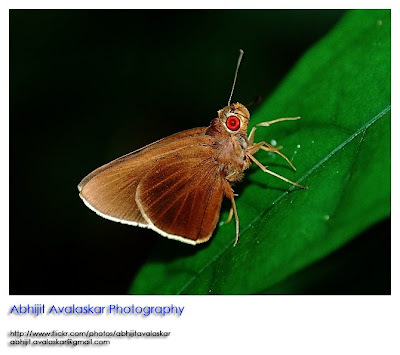 The photographs were taken from Jaipur area of Howrah District, West Bengal (3-4 m MSL). I was at my favourite place in Kerala, Edamalayar during the past few days to capture my favourite picture!! So pls excuse my late response!! 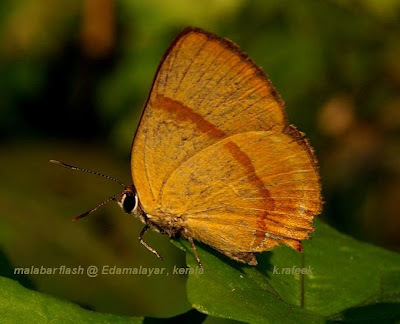 The Malabar flash-Rapala lankana was on my look out for a long time ever since I saw it at Akkulam, Trivandrum a some years back. 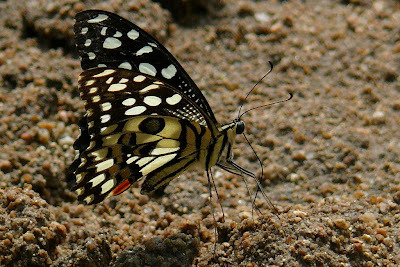 Lime Butterfly taken on 07-10-2007 at Narsapur forest 50km from Hyderabad while a group of about 10 are mud pudling arround 11.00 AM. Here are two best shots of 2007 from me. 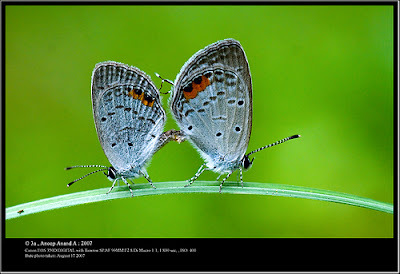 Both these were shot at Perumbalam an Island near Ernakulam. in Sptember. 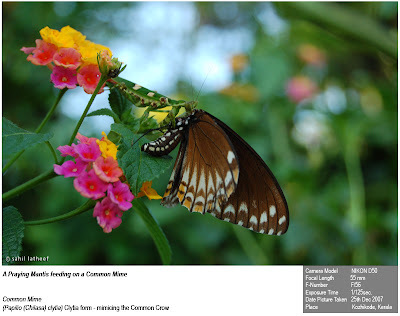 The Psyche was on Cleome gynandra pant probably the food palnt for its caterpillars. 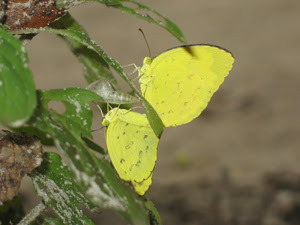 The Grass Yellow was on Ocimum sanctum. 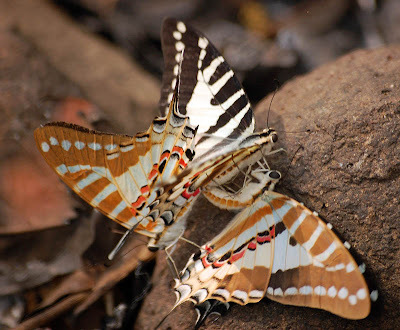 In both the cases I saw the attempts of other males trying to dislodge the already mated male in vain. 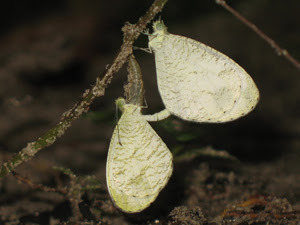 In both the cases the female had just emerged from the pupal case you can see it is still sitting on it. 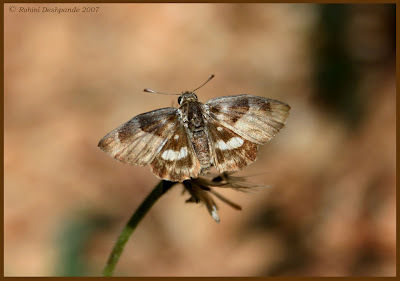 It is African Mallow/ Marbled Skipper. I liked the shades of brown in this picture. 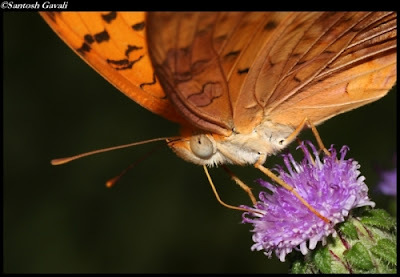 This was the last butterfly picture I took in 2007 :( After this the huge field next to my home which housed more than 50 species of butterflies was cleared to make way for basketball/football courts. Most of the pictures of butterflies that I have taken http://www.flickr.com/photos/rohiniad/sets/72157594219834398/ were from this place. 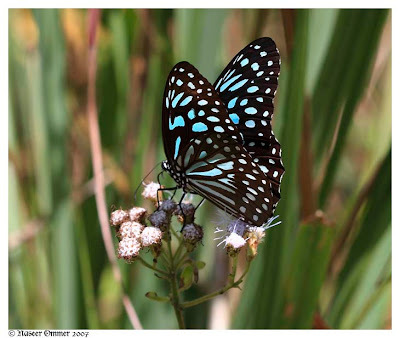 This place in Bangalore city was a heaven for butterflies. 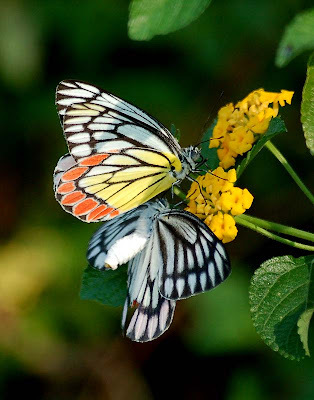 It had more butterflies than the Bangalore's butterfly park! 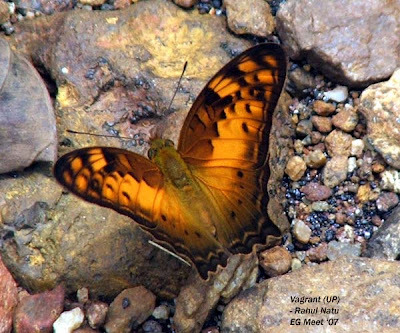 Since I haven't been living in India since a few years now and I visit only on short break I didn't have a huge collection of Indian Butterfly pix for 2007 to pick from, nonetheless I decided to share this one as my favourite for the year gone by. I chose to share this image because it portrays yet another aspect in the life cycle of these beautiful creatures - as someone's meal. 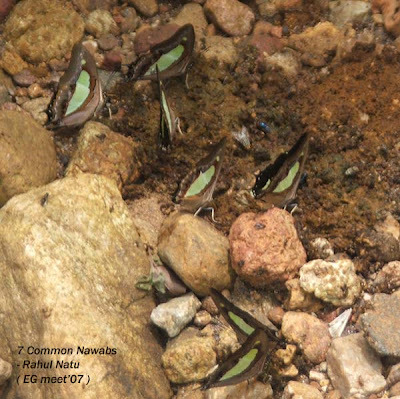 The image shows the Clytia form (mimicing the Common Crow) of the Common Mime Butterfly (Papilio (Chilasa) clytia) being devoured by a Praying Mantis. one branch to another. Final attempt proved to be successful. 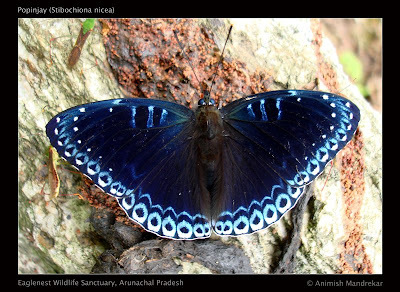 First snap is from Eaglenest Wildlife Sanctuary, Arunachal Pradesh. 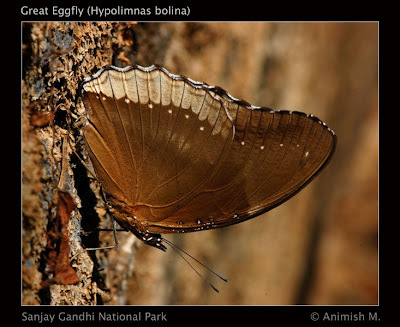 I was amazed by seeing the beauty Popinjay. 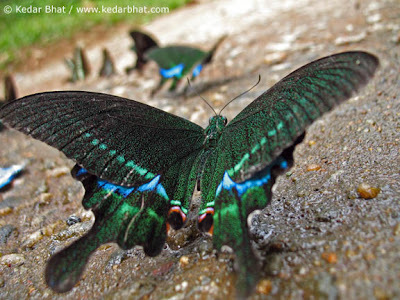 I think the designs and patterns on our attire must have been copies by mankind from these beautiful creatures. 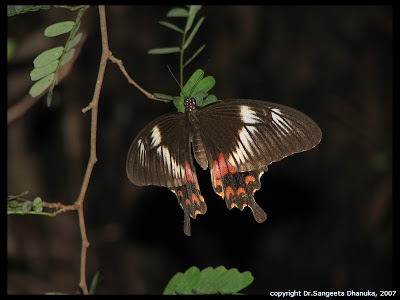 The second snaps is taken from my very own backyard Sanjay Gandhi National Park. 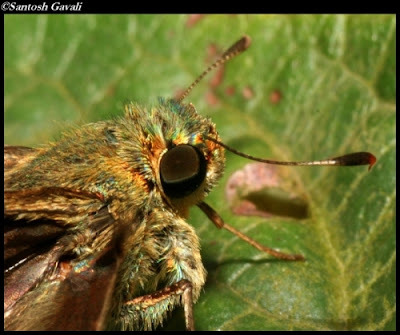 Captured this mimic while resting on wall in the heart of the forest. More to come .... Keep visiting.